A Roman silver denarius of Faustina I (138-61), posthumous issue dating to the period after her death in AD 141 (AD 141-61, Reece period 7). AVGVSTA reverse type depicting female figure standing left (probably Ceres [veiled]) holding sceptre in right hand, left hand not visible. Mint of Rome. Reference: RIC III, p.70, no.356 (denarius). Obverse description: Bust draped right, hair waved and coiled on top of head. Reverse description: Female figure standing left holding sceptre in right hand, left hand not visible. Probably Ceres [veiled]. 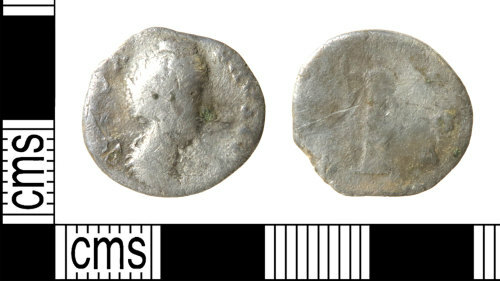 RIC : 3 no.356 (denarius).